Updates on the Government's work to grow the number of electric vehicles on New Zealand roads. Energy and Resources Minister Megan Woods announced today that low emission transport will receive another boost totaling more than $11 million. She marked the occasion with stakeholders including Ngāi Tahu Tourism CEO Quentin Hall (left) and EECA CE Andrew Caseley (middle). Ngāi Tahu Tourism's project was among 31 to get the green light – also a new record number. Each previous round has given the green light to between 14 and 18 projects. Applications to the next round will open soon - stay subscribed to this newsletter to hear it first! Pictured: Minister Megan Woods with Quentin Hall (left) and Andrew Caseley. A 100% electric Britz eVolve campervan shared the limelight with the Minister during her announcement, as an example of how projects were linking up to create a stronger impact, she said. Ngāi Tahu Tourism will be co-funded to install seven rapid chargers at key tourism sites, while Tourism Holdings Ltd (thl) was co-funded to build an electric campervan in January 2018. The thl project included working in partnership with Holiday Parks New Zealand to install 54 AC charging stations at 24 holiday parks. These are included in itineraries for North and South Islands with charging stations at 100km intervals. 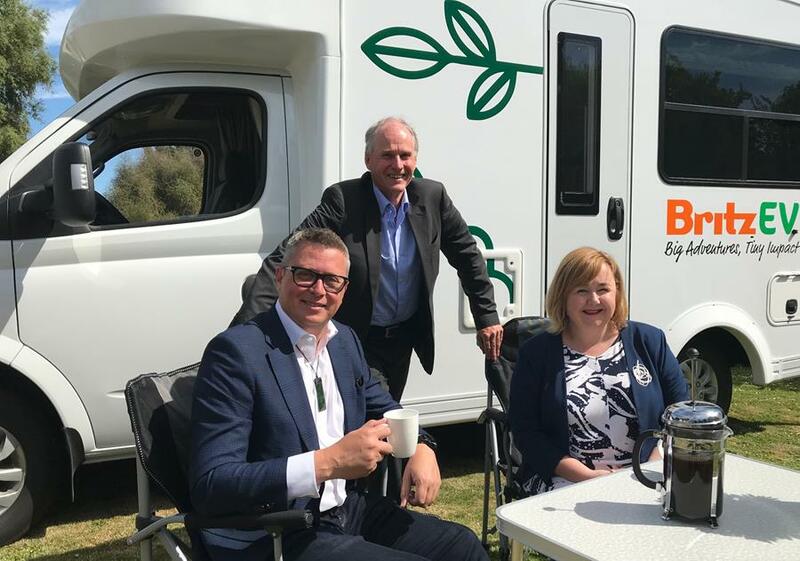 "I look forward to seeing the electric campervans charging up at Ngāi Tahu Tourism’s sites, or travelling popular tourist routes opened up by other co-funded projects," Minister Woods said. Ports of Auckland, with project partners Auckland Transport, Auckland Council and KiwiRail, will procure a hydrogen fuel cell (HFC) bus and three HFC cars as part of its wider project to build a hydrogen fuel production plant. Vector will trial two smart ‘vehicle-to-home’ chargers and EV chargers in Piha, including testing the resilience of the systems and their potential to reduce peak demand. Alsco will test the feasibility of a long-haul heavy electric truck between Rotorua and Tauranga. Orix will offer certain customers the chance to swap one leased petrol/diesel vehicle for a leased EV and free slow-charger at no extra charge. Chargemaster will establish a demonstration site using solar PV to charge an EV. Funding for 34 more public charging stations, including several at South Island tourism hot-spots. Global EV specialist Christina Bu's visit to New Zealand in November was a huge success, generating a tonne of media coverage. Christina spoke to punters in Auckland, Wellington in Christchurch, reminding them transport is the easiest way to reduce emissions because the solutions are already there. Consumers, manufacturers, industry and government need to team up and get things changing now, she said. Christina was hosted by Drive Electric with support from EECA and Meridian Energy. administers the Government's Low Emission Vehicles Contestable Fund and EV information campaign.